Charcoal and Charcoal DST panels that can be cut, allowing for a bunch of functional and creative options. Reduce unwanted slap and flutter echo, and other sound problems, in your recording space. The Auralex D36 Designer Series Roominator Kits span a wide variety of applications, addressing the acoustic and aesthetic needs of the small project studio as well as the most demanding professional mix/mastering environments. Whether it's your first home studio, a home theater, or a noisy listening environment, the D36 Designer Series Roominator Kits are designed to dramatically improve your acoustics, and give you a great designer look. Now you can have the expertise, features, and performance that you have come to expect from Auralex. Do you know what a bad-sounding room sounds like? Two common examples of bad-sounding rooms that you're probably familiar with are gymnasiums and tiled bathrooms. The good news is that by implementing the proper acoustical treatments, you can make even the worst-sounding room good enough to yield world-class sound. Controlling reflections within a room yields truer sound and allows the "real" sound of an instrument, voice or loudspeaker to come through. The D36 Designer Series Roominator Kit offers you a starting point to reduce unwanted slap and flutter echo, two of the most common sound problems, in your room. Think of all the creative possibilities these kits afford you as you begin to tune your room. 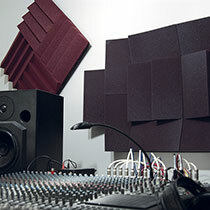 Add some Auralex LENRD bass traps to help optimize your room. Easily installed to finished walls with the included EZ-Stick Pro Mounting Tabs. Perfect for a vocal booth!